This story, part of a yearlong series on poverty we are doing at School News Network, took me into the classrooms of two remarkable teachers in Grand Rapids. For a fuller glimpse of what they do there, you can check out the story package here. 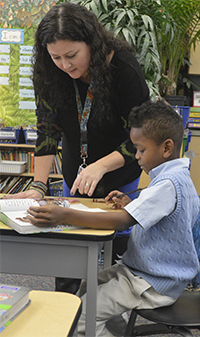 That philosophy, coupled with high expectations and well-structured lessons, make teachers like Boase especially valuable in low-income schools, experts say. For students like Ja’Quon, an effective teacher can make a big difference in a struggling life. While schools employ multiple strategies to help students in high-poverty schools, the power of a single teacher to impact a student should not be under-estimated. Studies have shown effective teachers can significantly raise academic achievement, graduation rates and even lifetime income. Some 92 percent of its 300-plus students qualify for free or reduced-price lunches. But Palmer scores above the average school in GRPS in standardized tests, and at the top for high-poverty schools. 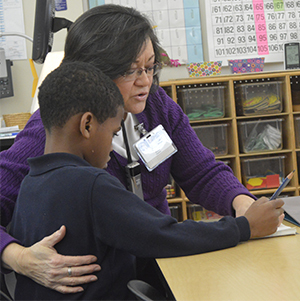 Further, in an annual survey of students, 95 percent of second-graders said their teachers are caring and provide challenging instruction. I’d like to have a reading corner like this in my house! “The big thing about working in a school with poverty is having a different set of eyes that sees beyond their academic record,” Boase said. “You have to know how to say, ‘What’s going on with you today?’ They might have heard Mom and Dad talking about how they’re going to pay the bills. They might be grumpy and might not come in having had a good night’s sleep. You have to see what’s going on in their lives. 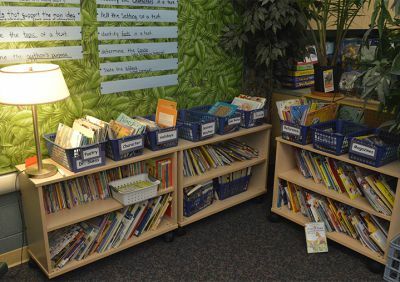 It was part of a lesson framework called the “Daily 5,” where students have the option of five activities such as reading to themselves, read with another student or listening to someone read. Students are grouped according to their literacy needs. She alternates these small-group times with whole-class sessions.